Fitzroy Street is on the up and the new incarnation of Tolarno is part of the renaissance. First opened in 1965 by arty bohemians Mirka and Georges Mora, then taken on over the decades by the Massoni family, Iain Hewitson and the Grossi family, this eating and drinking institution recently slumped into silence. The new owners – John Isherwood, former chief executive of Peter Rowland caterers, and his partner Lachie McKenzie-McHarg, a finance guy – are relishing the notion of restoring their charge's place as a neighbourhood hub and, along the way, being part of the rejuvenation of St Kilda's grand boulevard. Just down the street, the troublesome Gatwick rooming house has been taken over by The Block television show. Over the road, the Victorian Pride Centre will soon bring hundreds of people to the strip. And later in 2018, the Sand Hill Road group will reopen the Espy at the far end of the boulevard. In the meantime, Tolarno is already luring locals who are delighted that their old hangout is sparkling once again. The bar and restaurant are almost separate venues, though the same kitchen services both and there's crossover on the snacky parts of the menu. The snug street-front salon is something of a shrine to old St Kilda, with photographs and keepsakes, plus board games and books to signal that it's fine to settle in. 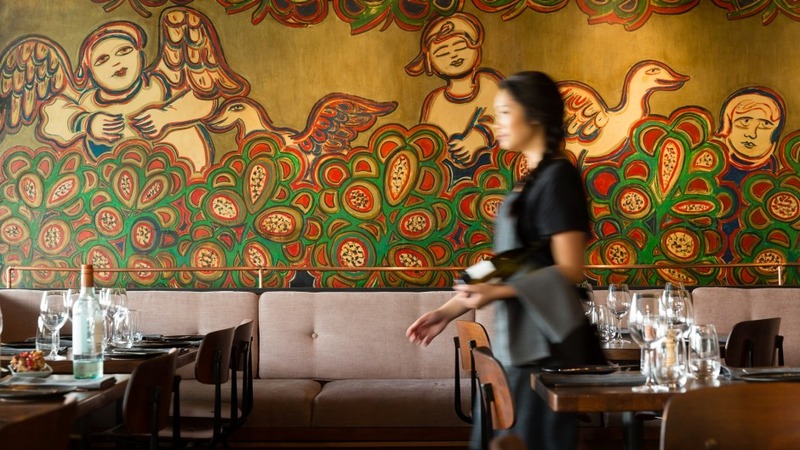 Across the hallway, the dining room is one of Melbourne's most beautiful, ringed by Mirka Mora's cheeky naif murals. They've been restored and the ceiling has been painted black, making the paintings shimmer and dance. 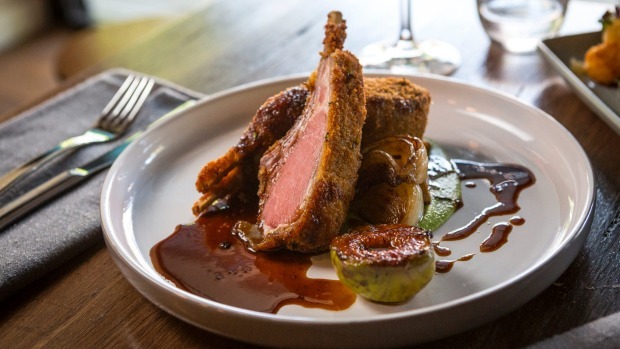 Chef Sam Parslow (ex-Chez Dre) is running an approachable, hearty menu with plenty of clever touches. The rice for the arancini is cooked in a stock flavoured with portobello and porcini mushrooms, which is then heavily reduced and turned into a jet-black "mushroom ketchup". This is dotted on to the plate, forming a base for the golden-crumbed risotto balls. Parslow lived and worked in Japan so it makes sense that his yakitori skewers are so tasty. The trio of speared chicken thigh, fresh shiitake and octopus is garnished with the condiments you might find in a traditional yakitori bar: ponzu dressing, chilli oil and pepper blend togarashi. Main courses rely on good produce, well rendered. Lamb rack is cooked pink then crumbed in chervil and parmesan for a final crisping. It's plated with peas (so far so classic) and a lamb jus that's sweetened with pureed fig. It's nicely judged and very generous. 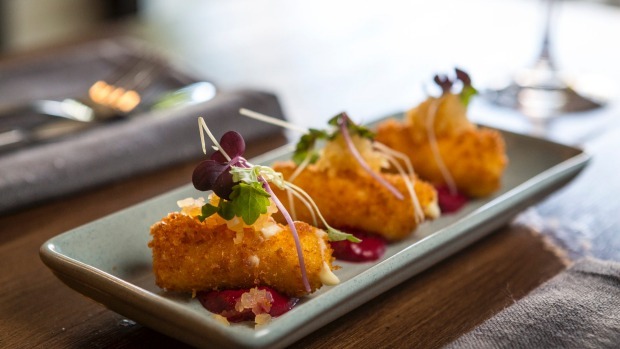 Pork belly is triple-cooked and served with a golden puree of beetroot and saffron. Again, fruit finds its way into the sauce, blood orange bringing tartness to the pork jus. 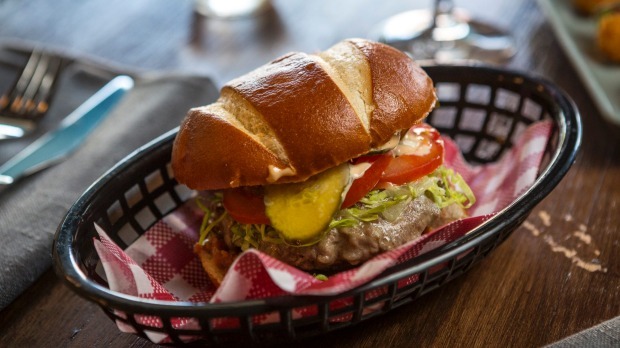 Especially in the Hewie days, Tolarno was lauded for its burger. Today's version stars a 100 per cent wagyu pattie, layered with Jack cheese (melty as), bacon jam and house-made pickles. Sam's special sauce is an aioli spiked with pickle brine; his ketchup is a tomato sauce made with roma tomatoes cooked for two slow, sweet, persuasive hours. This is the kind of food designed to draw customers a few times a week: an Aperol spritz and trivia in the bar on Wednesday, a birthday knees-up on Friday, a compulsory smashed avocado on Sunday morning. Tolarno is back, baby, and Melbourne is the better for it.